With the purchase of a new Ford F150 truck, we decided that we wanted to make a few upgrades. These are upgrades we did not purchase from the dealer because we knew that we could do them on her own. Truthfully there are so many ways to modify a truck, and the cosmetic modifications are the easiest. We needed a bit more functionality for the bed of the truck, and a little more ‘POP’ for color. Matte black is great, but the shine is always better. If you know where to shop for the products you are on the right road! Upgrade your truck’s style and performance without having the dealer do it for you. There is just something about DIY on upgrading trucks that is a part of truck pride and ownership. First, read my article and see our before and after Ford F150 modifications. I will share with you where to get all the upgrades and accessories. 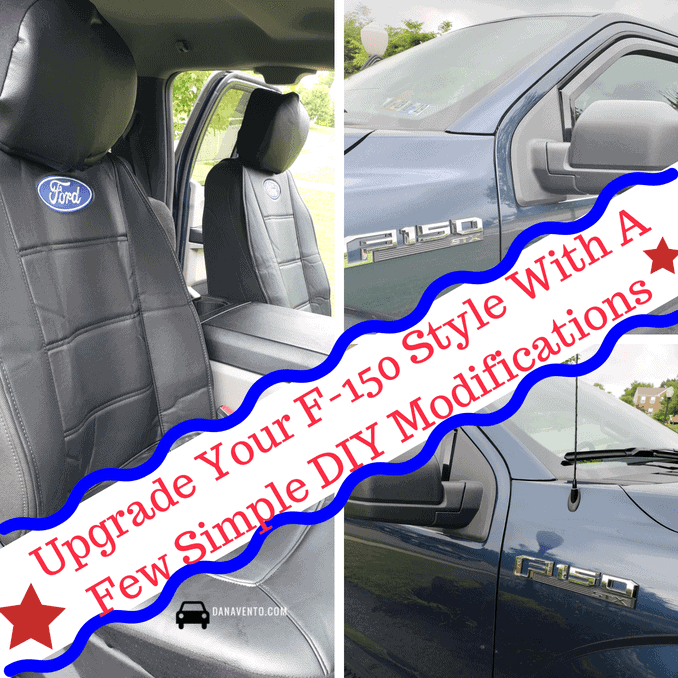 Lavishly live F-150 ownership out loud, and lets DIY, it’s your turn to Upgrade Your F-150 Style With A Few Simple DIY Modifications! Trucks are like a house, there are always add-ons and things you can do to make it your own. First things first, you have to decide what part of your truck you want to upgrade first. Will it be accessories, like decals, mudflaps, interior trims? Or are you up for changing the front and rear bumper? Possibly you are ready to add on throttle enhancement for the Engine? What about the exterior of the truck? Mudflaps, fender flares, grilles, roll bars and chaise racks, I mean the sky is the limit. We worked on the basics and making small changes to get big results in looks. From the seats to the windows, and of course the floors, our first round is all about preservation before the wear and tear! The site you are looking for to upgrade your trucks style and performance is American Trucks. There’s a great customer service team, and parts that you really crave to make the small and the large changes. Did I mention there are how-to videos as well as ratings for the difficulty of installation? Personally, I refer to those as One Beer Installation or 2, lol. Grab your keys, park your truck, order your parts, get your beer cooler and set to work on some modifications! It’s part of the Ford Truck ownership thing, upgrade, modify, and enjoy! As a business (my husband’s) we are FORD strong. Every last One Ton to Pickup is a FORD and there are no exceptions and never will be. Our fleet looks like a walking FORD Commercial. That said, we are intimately familiar with what we love, and what we might want to modify when it comes to the pickups. Our newest truck: Blue Jean Blue – 2018 2.7 L V6 Eco-Boost Supercab 6.6 Foot Bed with a Tool Box on (20″) toolbox attached. So we have a few challenges. The truck was needed fast and between the price the dealer offered on some accessories and delivery time, Michael (my husband) decided to just take the truck as it was and DIY the mods. The floors, the windows, the bed, and the seats were what we decided to tackle first. So, here’s our before and after, as well as the links for you to find what we got. While our floors are easy to clean, who feels like it? I mean, taking the hose to the truck often is a serious PIA. So, our solution was easy, we decided to get mats for both the front and the back of the truck seats. First, we cleaned out our 3-month mess, which seems to be much better now. Then we let it dry. Last we added in these Husky Weatherbeater Front Floor Liners. The change is perfection. Now we are ready to let it be a work truck! So here is what we started with, just the basic, squirt it out rubber lining, but why keep it so basic. The back of the truck has passengers and lunchboxes, and messes. We decided to do a Husky Weatherbeater 2nd-floor liner in here. Let’s take a look at the before and after. Just make sure you put the back seats up before you do the install it goes much easier that way and faster! Ready? This is one solid piece, and such a simple installation. I thought it was going to take a while, but literally minutes from start to finish and so much easier to maintain and not worry about. 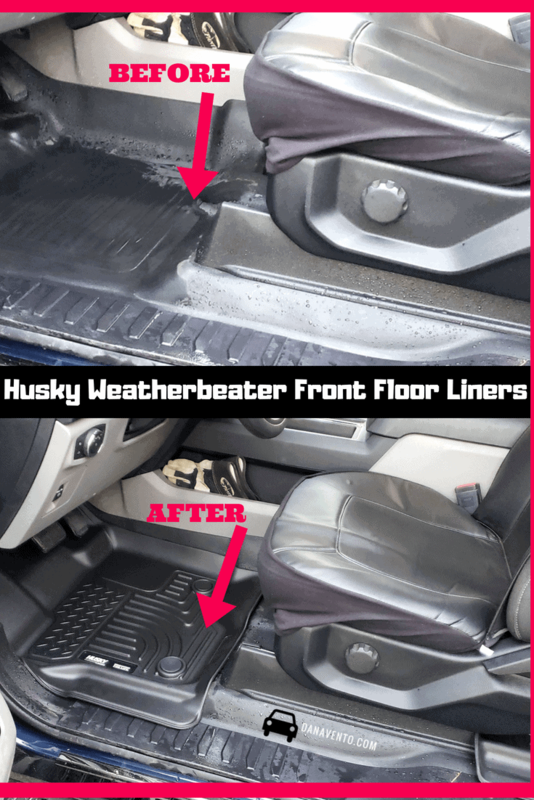 So you want one more look at the before and after of the 2nd seat floor liner? It is better to see it next to each other in my opinion. Yes, the product is rugged. It is great to keep the truck clean from rain, mud and snow and it offers FormFit design for precision fit, you can see that. Our door handles were matte black, and while it looks very nice against the dark blue jean paint we decided to upgrade. Anyone can have the black matte, but not everyone goes shiny. We did! This to give it a little pop of color. You can see the before and after and it is a stunning difference. It is amazing what one little change can do for a vehicle. We like it much better. It’s is easy to do, just clean the surface with rubbing alcohol, allow to quickly dry, peel 3m sticky tape on the handle and apply. DONE! 1 Beer Easy y’all! When you open that door of the F1 50 you want to make a statement, after all, it is big and beautiful so show it off. Part of ownership of an F1 50 is about showing it’s awesome power as well as its amenities! We decided we wanted to see and share with the world our purchase of an F1 50 so take a look at the plate we installed! First, wipe off the door, then you use rubbing alcohol and then you peel the tape off the back from the plate and apply that is it it is a very simple and so maybe two minutes total. Very subtle but very bold! A very simple install taking about 10 to 15 minutes per seat. In addition, they offer the Ford logo so it’s perfect to show pride in Ford ownership. Now let’s take one more look at the after. Added Upholstery Protection and a headrest is included for those super dirty heads! The cover is Black with Embroidered Ford Oval Logo, and it is very durable vinyl. Did I forget to say the covers are machine washable? They are a set for both front seats. It’s the small things that make big changes and we went straight to the Tires. Well, actually where you fill the air the generic valve stems and we added Ford Valve Stem Caps. These little hexagon shaped valve stem caps perfectly announce “FORD“ ownership! The before and after is significant and truly is a matter of walking from tire to tire taking off one And replacing the valve cap with another. It’s that simple! Our F-150 transports our daughter back-and-forth to school during college time, and we have a lot to move when we take her. We are basically filling up an apartment.Soon our other son will be going to school and we will be doing the same. We tirelessly work around our house doing DIY improvements and these call for trips to our local Home Depot store. However, when it rains, we can not run for materials with this truck because the bed was not covered. A toolbox is great but causes issues with most truck bed covers. Talk about the perfect solution! So we have been struggling with these just a little bit, to be honest. The adhesive tape did not work as well as we wanted. We did clean it and allow it to not move for 24 hours, but the front right one slips. Not sure if it is a manufacturing defect or what, but, we still prefer this over nothing on the windows. You can crack your window without a huge whistling or rain incoming. On hot days, or really rainy, a little bit of air feels good. They look sleek. Stay tuned for any updates on this product. As you can see a few simple changes, Ans a few DIY projects, and none taking us more than 30 minutes to complete all have transformed our truck. Don’t let the FORD Dealers talk you into their modifications and so much extra investment in the initial purchase. Most of what you will want to change or modify on your Ford trucks can be done at home, in your garage, driveway, etc. Dana is a travel, food and car/truck writer who resides in Pittsburgh, PA.
Hey Dana your car looks really awesome with those modifications. Keep it up,loved reading your article. Very interesting ideas, Dana! As a long time devoted F 150 fan I liked the proposed solutions a lot. The logo of your blog on the rearview window looks especially unique. Your blog is a great source of amazing ideas! Great Tips you shared. Thanks for that. Do you use any ceramic coating for your Car? Do you use car care products for this beast?